One of my resolutions this year was to play 10 games from my pile of shame and I cannot believe that I am writing my fourth entry for this series and am only two away from actually finishing one of my resolutions. My pile of shame has grown every year and this is the first time I have made a concerted effort at addressing this all too common issue. In my first entry I played Abyss and Colt Express, my second entry featured Carrotia and Codenames, my third entry included Just Desserts and Machi Koro: Bright Lights, Big City, and my latest entry includes Mice and Mystics and Clank! : A Deck-Building Adventure. Mice and Mystics by Plaid Hat Games - Mice and Mystics is a cooperative, story based game in which you assume the roles of humans who have been turned into mice to escape from the clutches of Vanestra. Gameplay is divided into chapters, which instruct you how to set up the tiles, what miniatures you might be battling, and any special rules for that scenario. If you are successful you advance the story and continue, if you fail then you can replay the chapter. While my son and I haven't advanced far in the story yet, we have had an absolute blast playing the game and enjoy the cooperative dungeon crawl feel of the game. 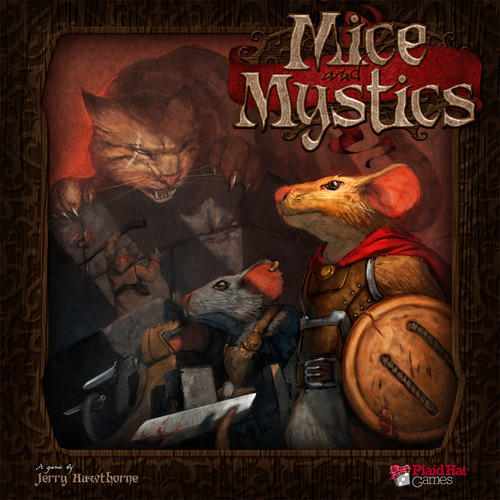 The art and miniatures are incredibly well done, and the story is immersive and entertaining. Don't let the cute art, miniatures, and cardboard cheese fool you. This is not a children's game. While it is appropriate for younger gamers, it provides a robust experience that is a good fit with any gaming group. I look forward to seeing this hit the table in the near future and look forward to continued adventures of Filch, Maginos, Nez, and the others. With my son's help, we will stop Vanestra! Clank! 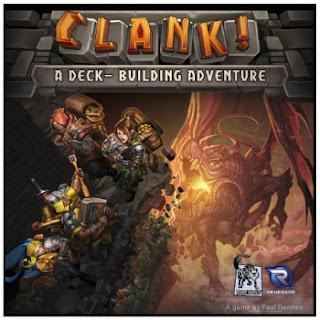 by Renegade Game Studios - I heard a lot of hype about Clank! before I was able to get it to my table and worry that it hampered my experience. While I enjoyed the game and can't wait to play it again, I didn't feel it didn't live up to the expectations that other reviews provided. Clank! is a deck building game, in which adventurers explore a dragon's cave in order to secure valuable treasure. The deeper you adventure into the cave, the more victory points you can achieve. This is not as easy as it sounds, as once the dragon is awakened there is a mad dash to the surface and failure results in death. As you adventure you make noise or clank. When the dragon is disturbed, he attacks and the more clank you have created the more likely you will be wounded. I think I wasn't as excited about my experience as I expected is because everyone in our game made it out alive with some pretty impressive treasure. One of the aspects that I really enjoyed about this game is the multiple approaches you can take. You can try to quickly grab a treasure and escape, making noise in attempt to foil the other adventures, or you can venture as deep into the cave as possible in order to secure the most valuable treasure. Another fun element of the game is the notion of Clank! It was fun to make noise to move farther into the dungeon knowing it put you at greater risk. Drawing the clank out of the bag to see who the dragon attacked provided exciting moments that impacted how you would plan your upcoming terms. I do recommend Clank! and am looking forward to playing it again, but have other games on my shelf that I enjoy more.